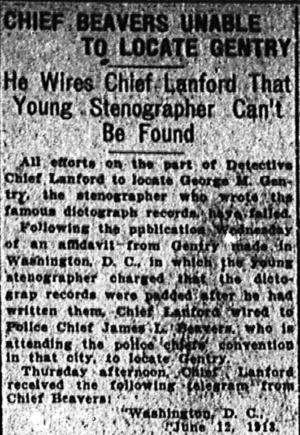 All efforts on the part of Detective Chief Lanford to locate George M. Gentry, the stenographer who wrote the famous dictograph records, have failed. Following the publication Wednesday of an affidavit from Gentry made in Washington, D. C., in which the young stenographer charged that the dictograp [sic] records were padded after he had written them. Chief Lanford wired to Police Chief James L. Beavers, who is attending the police chief’s convention in that city, to locate Gentry. “Have been unable to locate Gentry. Chief Lanford takes for granted that Chief Beavers enlisted the aid of the Washington police and detectives in his search for Gentry and their future [sic] to find him indicates that he is not now in Washington. Members of Gentry’s family state that they have no idea where he is, and E. O. Miles, the private detective, who brought back the Washington affidavit, refuses to divulge the young man’s address.